It was an early start for the soldiers of both armies on the morning of 25 October, with the men assembling for battle soon after daybreak (around 6:40 AM on that day). Time was set aside for observing religious practice prior to the battle, with Henry said to have heard three masses whilst still in armour according to the Burgundian chroniclers Waurin and Le Févre. The English were drawn up into three divisions known as battles, with the vanguard commanded by Edward, duke of York, placed on the right, the mainguard by the king himself in the centre, and the rearguard by Thomas, Lord Camoys on the left. 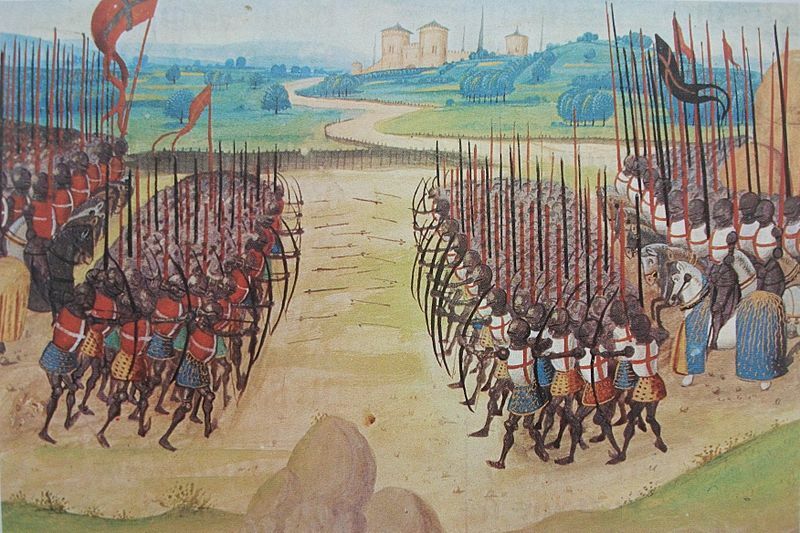 Whereas the French host consisted of a large battle placed in the vanguard, with one or more battles placed behind them, together with their archers and crossbowmen placed in the rear. Both armies stood on the defensive for some time. Awareness that delays would favour the French who were still waiting for further reinforcements prompted Henry to order an advance by his soldiers into a new position in order to stir the French into attack. The signal to move was initiated by the raising of banners, trumpets and the war cry to ‘advance banners’. The French commanders were well aware of the damage that could be inflicted by massed longbow fire. For this reason they intended to knock the English archers on the flanks out of the way through a cavalry charge. The English, however, had devised a method to counter this measure through the making of wooden stakes that could be driven into the ground to form a barrier impassable to horses. As a result, the French cavalry were driven off with heavy losses. The bulk of the French army consisted of heavily armed and armoured men-at-arms on foot who now advanced across the battlefield. They had a significant numerical advantage over the English men-at-arms, which meant that they would have been confident of victory in hand-to-hand combat. However the failure of the cavalry charge meant that the English archers were still in position and could rain down volleys of arrows into their packed ranks. The sheer volume of arrows meant that they would have suffered disruption, injuries and even death during the advance, with the survivors hemmed in by those around them. They were driven so close to each other that they could not even raise their weapon arms. The heavy rain the night before also meant that the ground was muddy and difficult to walk in, which would have sapped their energy and made them vulnerable to falling over and being trampled by their comrades. Heaps of men are noted in many accounts. This helped to negate their numerical advantage when they finally reached the waiting English men-at-arms, who were able to inflict heavy casualties on them in the hand-to-hand fighting. The fighting further turned against the French when the English archers, having exhausted their supplies of arrows, took up a variety of melee weapons and jumped into the heaps. This resulted in the defeat of the French vanguard, with many of the soldiers killed or taken prisoner and the rest forced to withdraw. A separate attack on the English baggage train resulted in some of Henry’s jewels being stolen. The remaining French fled the field, and Henry ordered his men to search the heaps for prisoners. These prisoners were gathered together. At some later point – we can’t be sure how long this was before the first battle – the French threatened a new attack. This was possibly the arrival of the duke of Brabant. This prompted Henry to order the execution of all but the most high profile prisoners (for an account of how the prisoners were executed click here). English casualties by contrast were much lower, with the most high profile fatality being Edward, duke of York, who was killed along with ninety men of his retinue, almost a quarter of the total (for more details about Edward duke of York click here).